Poet, translator of English and Russian poetry, lecturer in the field of world literatures at the Yerevan State University. The publishing house of the Union of Armenian Writers issued his collections: "The Flying Bicycle" (Trtsjogh hetsaniv; Թռչող հեծանիվ, 2003) and "The Return of the Green Gods" (Kanatsj astvatsneri veradardze; Կանաչ աստվածների վերադարձը, 2007, published in 2010 translated to Dutch). (1) At his own expense, he released this collection translated to Russian under the title "Экспресс 'Солнечный маршрут'" (Yerevan 2011) (2). Vahe Arsen is a professor of world literature at the State University of Yerevan. In addition to his numerous publications in literary magazines, he has published two volumes of poetry, Trtsjogh hetsaniv (The Flying Bicycle, 2003) and Kanatsj astvatsneri veradardze (The Return of the Green Gods, 2007). Vahe Arsen (vlastným menom Vahe Arsenyan) sa narodil a vyrástol v Jerevane, a hlavné mesto Arménska je konštante prítomné v jeho poézii. Arsen miluje rušné mesto s jeho ružovastými tufovými domami, ako niekto miluje ženu: “And I / the early lover of the red city / I adore / her moist awakening.” (nechcela som pokaziť básnický moment prekladom). Mesto predstavuje magickú ozdobu, kde nákladiaky so železnými perami plačú ako dieťa bez hračky (v "Taxi, Taxi") a kde, v hale bytovky, stojí a čaká vlak ("Expres k slnku"). A zároveň rušná premávka deptá autora, rovnako ako večné staveniská a ľudské hordy, chladne neosobné, ku ktorým cíti, že nepatrí. Naregasi Art Institute presents Armenian culture to the world. In april, Naregasi Art Institute and the Alternative Cultural NGO have launched a series of literary events, "Meeting with Writers". First event was hosted on April 5th with poet Vahe Arsen. Vahe Arsen, joined by other Armenian artists, read his older and new poems and discussed with audience in between the reading. After the reading, there was a Q&A session. Vahe Arsen was born in 1978. He graduated from Yerevan State University. His poems were periodically published in literary journals and in the press as well as abroad (ADK, Germany, 2003). The collection “Flying Bicycle” was published 2003, and the collection “The Return of Green Gods” in 2007. In 2006, he was recognized as the winner in the annual, poetry contest of the International PEN organization. In June of 2006, he was awarded with “Irene Gyulnazarian” foundation’s “Best Poet of the Year” prize. In September of 2008, he was awarded with the “For Innovation in Poetry” special prize in the international awards ceremony “CIS Newcomer Cooperation” that took place in Moscow. In 2009, the collection “Game: Modern Slovakian Literature” was published in Vahe Arsen’s translation. He also translates fiction from English. In 2010, the collection of poems “The Return of Green Shadows” was translated into Dutch and was published in the Netherlands, for which he was awarded with the Dutch “Jambe – 2010” annual, poetry prize. "Poetry" is a series of programs that present and promote contemporary Armenian poetry. The guests are contemporary Armenian poets who make presentations of their own works. Boon is helping to promote and also archive that poetry. Vahe Arsen reads his own poem IN THE ROOM. Vahe Arsen was born in 1978, in Yerevan. He graduated and earned his Ph.D. in American and English literature from Yerevan State University (YSU). He is the assistant Professor of the Chair of World Literature at YSU. A poet and a translator he has published two poetry collections in Armenian - “The Flying Bicycle” (2003), and “The Return of the Green Gods” (2007), the later was translated into Holland and published in Netherlands in 2009. A collection of his poems “Express “Sunny Route” was translated into Russian and published in Armenia in 2010. Vahe Arsen’s poems has been translated and published in the USA, Germany, Russia, Georgia, Tajikistan, and other countries. He is a member of the Writers Union of Armenia since 2004. You can find more about the author here. 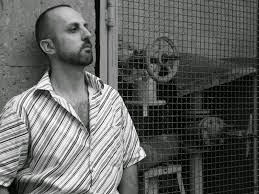 Vahe Arsen (whose official name is Vahe Arsenyan) was born and raised in Yerevan, the capital of Armenia, and this city is a constant presence in his poems. Vahe Arsen is a professor of world literature at the State University of Yerevan. In addition to his numerous publications in literary magazines, he has published two volumes of poetry, Trtsjogh hetsaniv (The Flying Bicycle, 2003) and Kanatsj astvatsneri veradardze (The Return of the Green Gods, 2007). A third collection has yet to find a publisher. In 2011 a number of his poems were published in Russian translation. Arsen himself translates poetry from English (including poets such as Walt Whitman, Dylan Thomas, Sylvia Plath and Emily Dickinson) and from Russian (Elena Zeifert and others). His leisure activities are boxing and karate.